The fifth release of Photopea is out! It has 12 551 lines of code. Play with it at the main site. Changing product name from "Photo Pea" to "Photopea"
Automatic layer styles (drop shadow, stroke etc.) are very useful features of every image editor. Currently there exist millions of PSD files, which use layer styles of Adobe Photoshop, so we decided to adopt them as the basic set of styles into Photopea. In future versions, I plan to add new styles or extend current ones by new features. 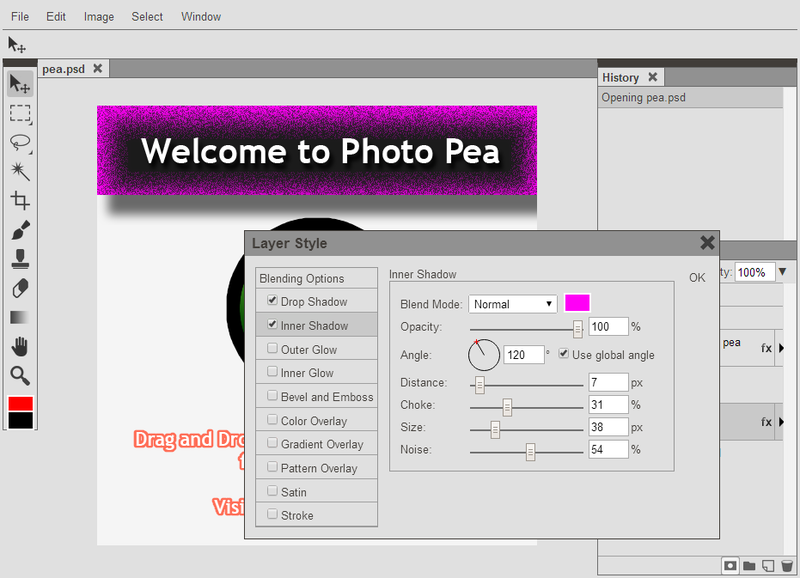 Note, that Photopea is only simulating styles from Adobe Photoshop. PSD files contain many numbers (parameters) for each style and Adobe does not say, how to transform those numbers into an actual image, so I implemented them as "how I thing they might work". I still have no idea how Bevel and Emboss work, if you know it, please tell me that in comments. Drawing gradients is also a very useful feature of image editor. Currently there are thousands of GRD files available for free on the internet, so I decided to add support for them. To use your GRD file, just drag and drop that file into Photopea.